Wow – very cool – the National Institutes of Health (NIH) is taking Maternal Mental Health very seriously and has launched a new initiative called Moms’ Mental Health Matters. The hope is that this effort will raise awareness for pregnant and postpartum mothers and their families — as well as educate providers so that they can better care for mothers and families. Education materials are available in English and Spanish. In my practice (and in my life!) I find myself working with lots of experiential avoidance. In other words – lots of the folks I work with find emotions painful and use coping strategies to avoid feeling their emotions. These strategies can include drinking, detaching, intellectualizing, over-eating, over-exercising, or doing just about anything in complete excess to keep themselves compartmentalized. The media and cultural messages of quick fixes and instant gratification don’t help. We keep going going going on autopilot until we hit a threshold and our dissatisfaction with this cycle makes itself apparent. So then what in the world can we do to start checking in with ourselves? Mindfulness meditation is one great option. There are a million ways to learn about mindfulness, and if you are interested please contact me for some in-depth guidance. But for now, I want to offer this great app I recently learned about called Stop, Think & Breathe. This app guides us to check in with our sensations and increase our clarity of how we are doing mentally, physically, and emotionally. It then creates a tailored guided meditation program based on how we report we are doing. Wow. Check it out! You can use this on your iphone, andriod, or on the web. Should pediatricians screen for postpartum depression? A recent study (as in February/March 2016, hot off the press) “Identifying Maternal Depression in Pediatric Primary Care: Changes Over a Decade” concluded that less than half of pediatricians screen or ask about maternal depression. This is a missed opportunity if you ask me. What provider does a new mother typically see more than any other provider? Her child’s pediatrician! The pediatrician can detect a perinatal mood and/or anxiety disorder and refer women for evidence-based psychological care. OK, so note to self, start to chat with more pediatricians in Tucson to see how I can provide education and/or services. And, of course, I am sure there is more to the picture and I have a lot to learn. So then the article suggests that more training is needed to help understand how crucial a mother’s mental health is to the development of her children. Isn’t this so obvious?? What is the possible argument against this? I can totally help people understand that link. Oh yes. The silver lining…..perhaps the good news is that between 2004 (N=457) and 2013 (N=321) the prevalence of pediatricians asking or screening for maternal depression went up from 33% to 44%. Still a ways to go but it is important to celebrate successes along the way, right? Citation: Kerker, B.D. et al. (2016). Identifying Maternal Depression in Pediatric Primary Care: Changes Over a Decade. Journal of Developmental & Behavioral Pediatrics, 37(2): 113-120. I can write for hours what I learned about screening, prevention, treatment, untreated consequences, medications, alternative modalities, etc. Yet the thought that keeps popping up for me is Why? Why, given the statistics and prevalence of perinatal mood and anxiety disorders, are prevention and services for mammas not a standard of care? Why do we screen for gestational diabetes (which affects 8% of women) and hypertension (which affects 5% of women) but not a perinatal mood and anxiety disorder which is the #1 complication of birth and affects 15-20% of women? Why, given how treatable these disorders are, don’t we have more therapists and psychologists in Tucson who specialize in treating Perinatal Mood and Anxiety Disorders? I hope to uncover the complex answers to these questions and be a part of a movement to get more services to mammas and families. For now, I will live the questions. A New York Times article published today shows that U.S. Preventive Services Task Force suggests women should receive screening for depression while pregnant and postpartum. The hope is that this recommendation will mobilize providers to pay more attention to perinatal mood and anxiety disorders, in light of the evidence that these issues affect a sizable amount of women (15-20%!). Needless to say, when these mental health issues are left untreated, not only does the mother suffer deeply, but it has an effect on her child. 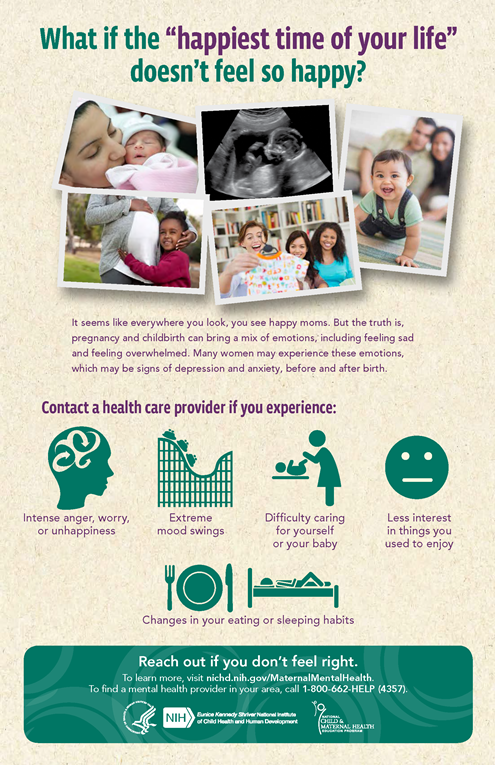 Perinatal mood and anxiety struggles are treatable. Please contact me to see if I can help you.